I've received a few messages from well meaning people to notify me that the Facebook app Fan Check has a virus embedded in it. I'd like to dispel these rumors. Fan Check is a buggy application. It doesn't work very well. Sometimes, it messes up your wall. But it does not, I repeat, NOT contain any viruses. The supposed antidote for the "Fan Check Virus" is tons more dangerous though. Many people just google for the removal tool for it. Guess what, you'll find lots of sites referencing a removal tool for the Fan Check Virus. If it's too late, there's still hope. There are legitimate removal tools to get rid of the illegitimate removal tools. One such tool is Malwarebytes (www.malwarebytes.org), a free program that I've had lots of luck with. If you have an infection Malwarebytes won't fix, or you don't want to mess with it yourself, email me. Or if I'm online, you can contact me through the widget below. I've seen a rash of disappearing CD drives lately. A couple different people have brought computers into the shop with this same problem in the last week. One left happy, the other... Well, the story's below with the fix to follow. Individual #1 (who we'll call Ernie) called and explained that his CD drive has disappeared, it shows up on the POST screen, but not in the operating system. I've seen the problem a few times, and have notes from when I successfully fixed it, so I told him I could fix it for $50. Knowing it was either a registry problem or a bad cd drive (which could also be replaced for $50). Ernie comes in and I fix his problem in less than 5 minutes time, which he's completely amazed with. He asks me a few questions, happily pays his $50 and heads out the door. Individual #2 (who we'll call Bert) calle a couple days later. The conversation on the phone is basically the same as with the previous one with Ernie. 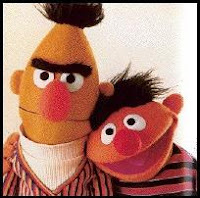 In fact everything was basically identical with Bert and Ernie, except their reactions when time to pay. Bert: Wow that was quick! How much do I owe you? Bert: What?!? That took you like five minutes!! Me: I told you what it would cost before you brought it in. Bert: Well that's too much for the work you did. Then I undid the fix, shut the computer down, unhooked it, and slid it across the counter to him. Bert: What did you just do? Bert: But I wanted you to fix it. Me: I did once, and I will again if you want--- for $50. So I fixed it again. He payed and grumbled his way out the door probably to never return again. Here's the fix for free-- hope it helps!! The cd drives tend to disappear sometimes when you mess with installing/uninstalling any kind of CD burning software. The fix is most often simply to delete 2 keys in the registry and reboot. The simple rundown of the fix is below, but if you're not comfortable with editing the registry, don't. It is by far the easiest way to brick your system. First you want to back up your registry, in case something goes wrong, you can restore it with your backup file. Close the registry editor and reboot, your cd drives should re-appear! A guy brought his computer in the shop the other day. He had a version of the notorious Anti-virus virus. I was backed up a couple days at the time and told him it would be early the next week before I could get to it. He started looking very very nervous, like he couldn't cope without his computer for that long. He asked if I had a loner, which at the time I didn't. He then told me he wasn't sure if he could make it until Monday without his computer. I had a good chuckle and talked with him a bit more before realizing he was as serious as a heart attack. He was truly distraught without his computer. The next day, everything else in the shop was either waiting on parts, or needing lots of time to fix. I went ahead and threw his on the table, partly because I knew it was a pretty easy fix, and partly because I was afraid for this poor man's sanity. It didn't take but about 30 minutes or so to fix, so I called his house and got his wife. I think I heard a "Thank you Jesus" when I told her the computer was fixed. "I'll be right there", was her reply, quickly followed by a click of the phone. Her truck pulled up minutes later, she quickly hopped out, and came in. "Thank you thank you thank you, I don't think I could put up with my husband another night!" As it turns out, this guy has a serious addiction to craigslist. Apparently, that's all he doe s when he's home. His kids had to leave the house cuz they couldn't stand to be around when he didn't have his computer. His wife was at her wits end. The whole family was ready to leave, because he couldn't cope without his craigslist fix. I was glad to know that not only was I able to repair their computer, but also their sanity. I just returned from a service call. The job was to troubleshoot a printer I had installed a couple months ago for a lady. On the phone when she called, I asked what the problem was. She just said she can't print. How right she was. Expecting to have to possibly re-install drivers for the printer, I slotted out a half-hour for my visit at the most. When I arrived this morning, I found a printer out of paper, the little green light flashing because it was out of paper, and 17 print jobs stacked up waiting for some paper to put it on. Thinking surely there must be more to this I asked for some paper for the printer, which the nice lady promptly fetched. I put the paper in, hit the little green flashy button, and just like black voodoo printer magic, it spit out printed pages. The above story, while completely true, was not intended as actual help in any kind of printer or other associated hardware tragedy. If you are experiencing any type of printer woes, I highly suggest seeking help elsewhere. Unless of course, your printer is just out of paper, in that case, this might be exactly what you're looking for. Got to checking up on our old pot-smokin'/hippy/psycho pal, Chief Wana Dubie. Only to find out he's steppin' up in the world. He's got his sights set on the Governor's Job. Dubious bid? Pot advocate running for governor. I don’t know how we missed this earlier, but the state’s “chief” marijuana advocate has signed up for the governor’s race - and he’s got competition. Ozark pot supporter Joseph Bickell has entered the race for the state’s highest office, and even if his position doesn’t earn many votes, his pseudonym sure will attract attention. Bickell’s name will appear on the ballot as Chief Wana Dubie, a moniker he has been using since the early 1990s. And as much as his name might seem like a gimmick, his appearance shows that, to him at least, it’s not a sobriquet he takes lightly: Tattooed on the chief’s forehead is a crown of thorns featuring a marijuana leaf. But the chief’s entrance has been viewed by dubious as some, especially in the Libertarian Party, in which Dubie claims kinship. Missouri Libertarians - hoping for renewed interest from Ron Paul’s insurgent candidacy for president - are concerned that the chief could hurt the party’s credibility. “That’s not how we want the Libertarian Party to be represented to people who don’t know the party’s platform,” Greg Tlapek, the executive director of Missouri Libertarian Party, told Riverfront Times scribe Keegan Hamilton recently. Dubie’s latest bid for office - he has also run for state rep - sparked some internal debate among Libertarians who, according to the RFT, discussed rejecting the chief’s filing fee to get on the ballot. Shunning a candidate for their extreme views, however, might have been tough to do for a party based on personal liberties. Dubie will indeed appear on the ballot as a Libertarian in August, but he might not be their in November. Filing to run a few days later was Andrew W. Finkenstadt, of St. Charles, who has previously run for county clerk as a Libertarian. Though some Libertarians may think that Dubie is just blowing smoke, at the end of the day, a contested primary could actually help the primary. One if by LAN, Two if by CD! !